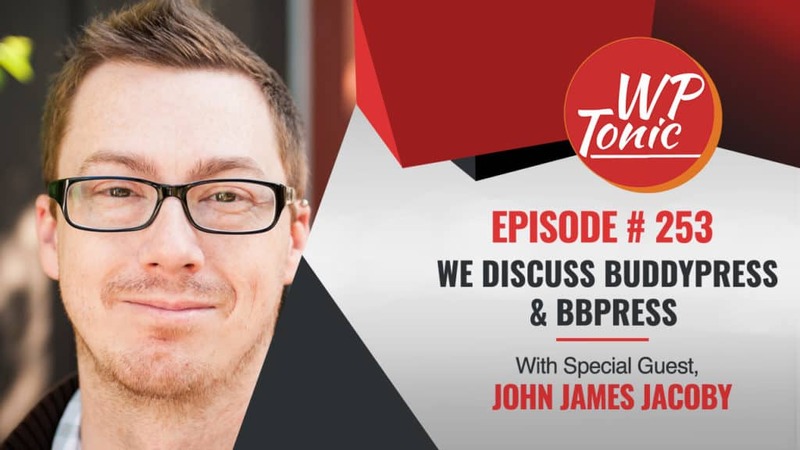 This week on Episode 253, John James Jacoby joined host Jonathan Denwood and co-host Kim Shivler to talk about bbPress, and BuddyPress. John James Jacoby, find him on Twitter at @JJJ, is the lead developer for bbPress and BuddyPress, and the team spent much of the interview discussing these two powerful WordPress plugins. bbPress is a classic forum plugin for WordPress. It is easy to install and configure and provides the opportunity for threaded conversations within your WordPress installation. 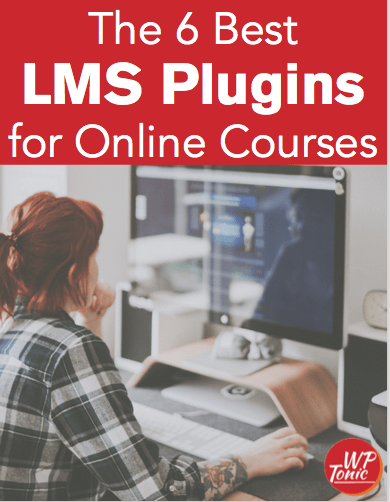 Kim Shivler talked about the power of this plugin within Learning Management Systems and uses it in all of her LMS sites. BuddyPress is a larger, more complex plugin that provides a social network within your WordPress installation. When your site uses BuddyPress, it provides everything you would expect from a social network. You can create groups, provide private messages between users, and deliver information to a feed. It’s similar to creating Facebook within your WordPress installation. John’s passion for bbPress and BuddyPress sprung from the fact that they are two of the most community oriented WordPress plugins. When he learned PHP, he learned on the web pre-WordPress and loved participating in forums. Forums were more popular then, and he enjoyed the community aspect of them. When he became a WordPress Core Contributor, he was drawn to these features within bbPress and BuddyPress. Jonathan: Welcome back folks to the WP-Tonic show. This is the Wednesday episode. It’s show 253. We’ve got a great guest here, great Wizard. He’s a bit of a naughty wizard but there we go. But he is a great WordPress Harry Potter wizard and that’s John James Jacoby. Like to introduce yourself, John? John: Oh, hello. JJJ, triple J, J Trip, whatever anybody calls me. Most people screw my name up and so I’ve just been accustomed to being called whatever people want to call me. And a terrible Wizard, like our pre-show, I’m a Weasley for sure when it comes to most. Jonathan: Yes. He’s under detention in the Harry Potter Training Wizard School. He’s been told off by the Headmaster. So there we are. Off we go. And I’d like to introduce my great co-host that has to listen to this dribble on a regular basis. There you go, Kim. Like to introduce yourself? Kim: Absolutely. I’m Kim Shivler. I’m a Business and Technology Instructor and . . .
Jonathan: You’re speechless, aren’t you? Kim: I just try to keep Jonathan in line. Kim: And I’m not doing very well at it. Jonathan: Yeah. And I’m not under any medications this week at all. John: I don’t think Jon can be kept in line. Jonathan: I’m not sure if I want to be kept in line. There we go. Kim: We’re going to pull out the cat claw. Jonathan: Oh God. She’s got the cat claw folks. Watch this on YouTube. She’s got the cat claw. Kim: You’ve got to watch it. So when Jonathan is good, he gets the nice cat. John: Oh, look at that. Oh, it’s so cute. Kim: No. That was the bad cat. John: That was the bad cat. Kim: It doesn’t want, oh, there’s the nice one. John: I like that we’re a minute into the show and Jon already got the bad cat already. Kim: Always, yeah. Okay, let’s get started on the real stuff. Jonathan: Yeah. I want to introduce myself actually Kim. I am the founder of WP-Tonic. We’re a support maintenance company, specializing only in WordPress with a leaning to helping people with Learning Management Systems and getting them started on that great journey. Before we go into our great conversation with JJ, we need to mention our kind sponsor. And that’s Kinsta Hosting, a specialized WordPress only hosting provider. I host the WP-Tonic website with them. They’re a great company. Small enough to really care but big enough to have all the bells and whistles that you’re looking for, not only for own site but also for your client’s websites. I’ve been totally happy with the service they’ve provided WP-Tonic. I wouldn’t go allow WP-Tonic to be hosted by somebody that I didn’t think was totally up to the job and Kinsta is. So if that’s interesting, go to the show notes. There will be links to Kinsta. They’re affiliate links but you’ll be helping the show as well if Kinsta is of interest to you and just click the link and they will get you up and running or up and running with your clients. John: I really like the Kinsta folks. They push the envelope with HHVM back in the day. They published a lot of articles. They tried to get a lot of people on board with the faster version of PHP back in the day. Jonathan: Thank for that actually JJ but I’ve just, really honestly, I’ve been totally really happy with their service. They migrated the site. They helped me backward to get everything set up. It was the best non-painful experience I’ve had with a migration in a long while. And if you need to talk to somebody senior, you just email them and they come back to you. So you can’t ask more than that, can you? So JJ, so where to start this conversation? So, obviously you’re well known for WordPress Weekly and I think you’ve been doing a great job there. Jonathan: And also as the lead in BuddyPress and bbPress. Shall we start with these? I don’t know which one you want to start with, BuddyPress or bbPress because I know you’ve got a real passion for those. Which one shall we start with JJ? John: So, I mean the thing with those two plugins, with BuddyPress and bbPress, is that they, and the thing I like about them is that they are the most user-centered type of plugins that there really is within WordPress. WordPress is just about your content and those two plugins are about the users. They’re about the community side of it. And so, that’s kind of what drew me into WordPress in the first place. So those are the two pieces of software that I think are the most rewarding to give back to. When I learned PHP, it wasn’t through WordPress. It was just through trying to learn how to write stuff on the Web in the late 90s, early 2002. Probably 2001 is when I really got into it. But that was when forums were a bigger deal than they kind of are today. That was kind of the way that my brain works and thinks. And so, those are the two pieces of software that I enjoy working on I think kind of the most. But WordPress Weekly is relatively new for me. Jeff asked me to know early in the year. I’ve kind of been a friend of the show and been on the show a couple of times. But it wasn’t until Jeff needed a co-host where I was like, “Okay. I’ll jump in and try and be helpful”. I think that’s a good fit for me because Jeff is so good. He’s such a natural on the mic in a Podcast format that all that I really do is just sit back and try and be his Ed McMahon and laugh at his terrible jokes and provide a little bit of core development side or Developer educational type of side and the occasional opinion. But, yeah. The long and short of it is that there’s a little bit more freedom in BuddyPress and bbPress than there has traditionally been in working on WordPress core itself. There’s a little bit more opportunity to level contributors up with BuddyPress and bbPress than there used to be in WordPress core. WordPress core development has changed a lot. So it’s a lot better than I think it was 5 or 10 years ago. I think they’re more fun. There’s a little bit more freedom that we have to do things than your average WordPress core contributor might have. The different between 29 percent of the Web and less than 1 percent of the Web means you’re able to make some decisions that maybe you couldn’t make with WordPress core itself these days. Jonathan: Yeah. You’re a little bit more on the sidelines which has its benefits, doesn’t it? So, how are these two projects going? Are there any major updates, improvements that you want to talk about? John: So, there’s a bunch. And over probably the past, I would say maybe 2 years or so now since we moved, there’s a woman by the name of Jennifer Dodd, who works at Automattic now, who has been a bbPress contributor for a really long time. And so, she took on the enormous task and gave a talk at WordCamp US this year about migrating all of WordPress.org’s forums over from the old bbPress to the new bbPress. So there’s about 4 million posts that needed to be moved and migrated and converted over. John: And so, bbPress 2 needed to be tweaked a little bit and needed some maintenance and some performance tweaks and some hooks and actions in places to make some of that happen. And so, bbPress has taken more of my time because it has been more of a need for WordPress.org itself. But consequently, BuddyPress also has more contributors. Jonathan: Well, actually, I think what we should do is, can you just give a quick outline what the difference between the two are? Jonathan: Because I’m just presuming that people know. Jonathan: And I think that’s a mistake. John: So, bbPress, the bb stands for Bulletin Board. It is kind of the old school take on bulletin board systems or forums on the Web. It is exactly what you would expect for forums to be and look like. There are forums. Forums have threads. And then people reply to those threads. And so, in typical WordPress fashion, it’s kind of like posting comments but it’s threads and replies and topics and replies. And so, it is a forum. It lets people sign up, create accounts and talk back and forth to one another in sort of a WordPress kind of way, with the WordPress flair on it. And so, that’s bbPress. That’s really all it is. BuddyPress is everything else that you would expect from a traditional sort of social type network. It is robust user profiles. It is an activity log of the things that are happening all throughout your WordPress site. It’s private messages between users. It lets users group themselves together. And those groups can have their own forums because BuddyPress and bbPress can both be active at the same time and they work with one another really seamlessly. And so, I’ve always looked at them as like if you’re building a community, you start off with a blog, you have some posts and you have some momentum. If people want a place to talk back and forth and comments isn’t that place, then give them a forum. And now there’s a place where they can talk back and forth with one another. And then, once your forum is huge and bustling and moving around, look at BuddyPress because now you can give a lot of control back to your users for sort of a more like a Reddit kind of thing. And they can create their own groups. They can subscribe to those groups. They can have activity streams and forums and talk back and forth. You really give control of your community over to your community with something like BuddyPress. As much as they both have Bs in their names and they’re easy to confuse with one another, they’re two different pieces of software that serve two different kinds of audiences. And because we use bbPress all over WordPress.org, it is the piece of software that honestly gets the most attention. But BuddyPress, as a piece of software goes, is sort of technologically more impressive and honestly is like 10 years ahead of its time when it comes to how WordPress plugins solve problems today. And so, not to keep going forever, but bbPress uses all the things that people are used to using. Custom post types, custom taxonomies and all of the WordPress built-in internals for doing everything. BuddyPress has always done the opposite. BuddyPress has custom database tables, custom APIs, custom code, hooks, everything to do everything inside of WordPress but also outside of WordPress because it is sort of a separate section of a site. So a lot of plugins that are really popular right now like WooCommerce or even Gravity Forms has had custom database tables for a long time. But WooCommerce, EDD, most of the stuff that EDD is working or related to stuff, all of the membership type plugins, the Ninja Forms folks, a lot of these plugins all use custom database tables because they need to to scale their application in a way that it works for something like 4 million posts like you end up with on WordPress.org. BuddyPress has always worked that way. And a lot of plugins architecturally are moving towards that model because they’re learning what we knew 10 years ago which is on the scale of WordPress.org or WordPress.com or on really active WooCommerce sites that have thousands of sales a second, it’s not just scaling an application to make WordPress’ posts table work correctly, it’s scaling a very sophisticated thing horizontally and spreading the pain around so that you don’t crash the 30, 300, 3,000 servers that something is working on. So BuddyPress is ahead of its time with those kind of things because it was architected to potentially have been a thing for a WordPress.com and we do use it on WordPress.org but we don’t really draw a lot of attention to it. And so, BuddyPress and the contributors behind it, I have kind of largely been absent for probably the past year or 2 on the BuddyPress project because everyone else has been working on all of the cooler, more modern pieces of it and I’ve been working more on scaling bbPress for the international forums, the Rosetta forums, WordPress.org, BuddyPress and bbPress forums and everything else. And so it is nice that we have those two alternatives. They do compliment each other really well. And they were like two of the first official sister projects to WordPress whereas now we kind of consider WP-CLI that and we have the concept of core plugins where Gutenberg is kind of one of those and Shortcake and we have all these other initiatives going on. And so, BuddyPress and bbPress are symbolic in a way of the early experimentation in the WordPress community of trying new things and seeing new software and testing the waters for which direction that WordPress and the community could go. There’s a lot of history there. So I’m lucky and happy and fortunate to have been involved in some small way in helping the community out with those two software. Jonathan: So you’re a happy Wizard. John: I’m a happy Wizard. Whether or not people are happy with my wizardry is a different thing. But I’m a happy Wizard. Jonathan: All right. Before we go on to our break actually and then I let my great co-host take over, I want to continue discussing these two great parts of WordPress but I just want to quickly ask about, you attended WordCamp Us, what were your general thoughts about how it went down and your conversations in general with people and their feelings about how WordPress is going in general? John: So that’s a very broad question that I will try not to go on for 20 minutes about. Jonathan: Please don’t because we haven’t got 20 minutes. John: The people that I spent most of my time talking to, I went to two sessions throughout all of WordCamp US. I spent the rest of the time in the hall way hanging out and having conversations like this. Jonathan: With the other Wizards. John: With the 1,800 or whatever other Wizards that were there. I went to Jennifer Dodd’s talk which I mentioned earlier and I went to the State of the Word. Otherwise, I accidentally did not make it to any other talks at WordCamp US. But depending on who you talk to, either people are super excited about what’s happening in 29 percent of the Web and all that. It’s all good news. And then, sort of polarizing, there are a group of people that are worried about the Gutenberg of what the future of WordPress is going to be with blocks and all those things. I don’t want to say that the future of WordPress is uncertain because that’s not the right word. But I think people feel uncertainty and I personally don’t think that people should feel that way. If that makes any sense. Jonathan: All right. I just want to quickly ask you about that because I think you’re spot on there actually in a way. It was a fantastic observation. I think there’s two parts of this and I said the same thing on Friday is that there’s some criticization which I do think has some level of legitimacy about it about how the project was scoped out, how it was initially the management of it and the communication of what its real outcomes and significance was going to be. And there’s been some considerable and also about the data that you utilize for a project of that size. There’s also the discussion that it might be a very opportune moment to really be more realistic about backward compatibility. And also slight concerns that the real data construction and how the new WYSIWYG interface is really going to really work with actual real data in a coherent much better way. So I think they are some of the more legitimate worries. Would you agree with that? John: I do. We care more than your average person does I think is ultimately, the point that I guess I’m trying to get to with people that are listening to this Podcast, for sure the people that follow me on Twitter or whatever, is that if we do a good job, then no one knows or cares where the data is stored or how it gets in or out or whether or not it scales or whatever. The difference is that because WordPress is open source and because we generally work publicly, that a lot of these conversations happen in public. They happen in Twitter or on a Trac ticket or on GitHub where these types of problems and bigger, they are solved every day. And so when Google or Apple changes the way that they store your iCloud data, it’s a big deal internally within the walls of Apple I’m sure for the 30 people or the 300 people that maybe care. But if they do a good job, we never notice what happens and whatever happens. So if we do a good job means that, sure web hosts will notice and will notice and because it’s public a lot of stuff happens in a public way. But all of the architectural stuff is interesting but it’s not user facing or impactful in any way that amounts to anything. And so, yes, it’s important that we do a good job. It’s important we think these things through. But we also can’t log jam the whole operation because we’re worried about which direction we want to cut the boards. We’ve got to just cut the boards, build the ship, sail on to the next problem. Jonathan: I see where you’re going. I don’t totally agree with it but I think we need to go for our break and we’ll discuss this in the bonus content section. We’re going to go for our break folks and when we’re back, my co-host is going to take over a while. We’re interviewing a great member of the WordPress community. A great Wizard of the community. So we’ll be back in a moment folks. Jonathan: We’re coming back. We’ve had an insightful discussion about spells, potions, all sorts of stuff. I’m going to let my co-host take over. Kim, off you go. Kim: Thank you, Jonathan. Actually, I have one question on the last point you wrapped up John and then I want to move forward. Kim: Because you very favorite plugins. So I’ll try not to turn into a complete fangirl here today. But I could. I’m warning you. Kim: I love what you were saying about the open source and that our conversations happen in public because I, in the past, was part of an IBM team and like you said our software, I was in the software side and things went on all the time that the public didn’t know. And I get that piece. The one place I do think we’re different around the Gutenberg discussions is it is something that affects those end users that aren’t always part of the conversation and those are my students. When I teach WordPress, I tend to teach beginners. Kim: And it’s one of those things that for them to wake up one morning and go to their blog and see everything different, that could be a nightmare. And that’s where I think some of this is coming around, not just the technical piece but the making sure we’re rolling this out for those bloggers and business users that aren’t listening to the conversations we’re taking. John: Right. Right. No, you’re absolutely right. Software is kind of the newest place where this is a real concern because before software, these decisions happened in an IBM kind of way. You didn’t have a whole lot of influence over the engineering that went into the automobile that you bought or the infrastructure and what went into the asphalt that eventually ended up on the pavement in the roads. Whereas now, we really do have a responsibility to do a lot of due diligence when it comes to what the end result of something like Gutenberg will end up being. And Morton, who I’m going to talk to in a few hours actually, is, in his WordCamp US talk touched a little bit on a lot of this where with user testing and knowing whether or not something is good or bad is useful and would be useful for something that is as critically important as literally the place where content goes in and out of WordPress. When you re-skin the entire thing, people don’t like when you move one link let alone when you move all of the links. And so, yeah, it is going to be jarring. It will be polarizing. One of the things that Matt, which I’m happy that he did at the State of the Word, clarified. I’ll give a little bit of a spoiler for what I’m going to talk about with Morton on WordPress Weekly. The State of the Word and the live demo that happened was like the most important thing for people that were skeptical because Matt clarified that Gutenberg is for new users. It is for the next 12 years of users that are posting to the Web and that it really isn’t for the previous 13 years of WordPress users. And so him saying that I think helped provide the direction that people were looking for. That like, “Oh well, I guess that makes sense if this is for what’s coming and it’s really not for the previous 12 years, then let’s just accept that that’s what this is”. And so, I think that offered a little bit of clarity but it doesn’t make it any less scary that that’s what we’re moving towards and we’re kind of sunsetting what we have been trying to work on this entire time. So, you’re right. Then this is where the uncertainty comes from. They want a fork of WordPress that doesn’t have Gutenberg or they want a fork that does and let them eventually converge and come back later. And that is an alternative. User facing changes like Gutenberg are the thing that bifurcates a community, “Oh, okay. Here. Now we’ve got a different trajectory because we really disagree with the direction that this is going”. That can be healthy for a project as long as everyone is on the level and everyone is sampling pieces from one another and working towards a similar goal. I hope that that doesn’t happen because it sort of divides resources and everything else. But, yeah, you’re right. I don’t know what to do. Kim: Well, thank you. I appreciate that because I think you have some insights or you’ve given us some insights that I haven’t heard before. We’ve had Morton on the show quite often. He is one of our Round Table members and he’s fabulous. And you’ve given me some new things to think about. So thank you for that. Okay, bbPress and BuddyPress. For my own stuff, I teach people to build Learning Management Systems. So I’m combining learning management, membership sites and bbPress is in every single one. Let me just tell you that. Kim: And I love it. It’s wonderful. It’s so easy to use. And so, one of my questions was, when you were talking about people knowing more about bbPress than BuddyPress, do you think part of that is that ease of use. Because BuddyPress is much more complex. If I’m teaching a beginning WordPress user, I’m not saying, “Put in BuddyPress right now and configure it”, because it tends to be a little heavier to configure and maintain. What are your thoughts on that? John: I think you’re totally right. For the people that are, like yourselves, that are deploying bbPress to users, your level of comfortability with WordPress in general is high. And so when you know that bbPress is made with the same ingredients that WordPress is made with, then the recipe is very reliable. Where BuddyPress comes with a whole bunch of different ingredients that you have never worked with before. And so, everything that is delicious is butter, flour and salt. And so, when you introduce chocolate, it melts different, the temperature is different, it cooks different. So, is it delicious? Sure. But do you know how to cook with it all the time? Not necessarily. And so, people don’t use BuddyPress in that way. They use it when they need chocolate. When they need that recipe, they’ll use it for that. Where bbPress is easier because it is more plain, it is simpler ingredients. Believe it or not, a lot of work went into making bbPress be as palatable as it is. People expect for forums to have a root of slash forums. So just always do that because that’s what people expect. Don’t make it too configurable or make them do all the work. Just do the work for them. And so, that’s what WooCommerce does now. It makes pages, it makes the check out page, shopping cart page, it does all these things. EDD does the same thing. And so, that was kind of on purpose was bbPress, in order for it to be popular at all, in order for forums to kind of make a comeback, they need to be super simple. And whereas I think because people are afraid of comments on blog posts because there’s a lot of contention about social media and the positive or negative effects that it has on mankind and all these things that BuddyPress is kind of purposefully still, although to its detriment, it requires a little bit of work, a little bit of implementation. And so, it makes me really happy to hear that you use bbPress on pretty much everything. But BuddyPress would be the thing that you eventually bolt on top of all of it. And then you have a more configurable user profiles or now you’ve got a place to plug the LMS in so you’ve got grades in very specific profile location. So you can start to see an evolution there of how you might use the two together. But, yeah, bbPress is sort of simpler by design. Kim: Excellent. I have used BuddyPress on two sites and I love it. I do love it. Kim: If you look at any of my presentations on building Learning Management platforms, I’ve done a few at WordCamps. BuddyPress is the one where okay, it’s that next step, it’s the big boy if you want to do this. But I do work with it and I love it. But like I said, bbPress is just, it’s my go to. And I am an old forum girl from the 90s. So I don’t do any custom CSS. I just let it go and that’s what a forum to me is supposed to look like. Kim: And so, I’m happy with it. I don’t even worry about changing that. Jonathan: I’m sorry to interrupt Kim. Jonathan: But we’re going to have to go for our, wrap up the Podcast part of the show but we’re going to hopefully continue the conversation which you’ll be able to see on the WP-Tonice website with a full set of show notes and a full transcript of our discussion so far. And hopefully, we’ll be going deeper into more potions, spells and other wizardry things. So, JJ, the Wizard, how can people get hold of you? John: Twitter and GitHub at JJJ. And you can see some pictures of my dogs and some musings on my blog at jjj.blog. Or Instagram, it’s mostly just pictures of the dogs. That’s probably it, I think. Better there than most places. Jonathan: And obviously they can listen to you on WordPress Weekly. John: WordPress Weekly also. Every week. Every Wednesday at 2:00 p.m. Central I think is when we kick it off on WordPress Weekly. Jonathan: That’s great. And Kim, how can people find more about your spells and potions? Kim: You can find everything I do at kimshivler.com or on Twitter @kimshivler. Jonathan: And if you want to learn more about what the Headmaster of the Wizardry University is up to, you can go to the WP-Tonic website. You can go to our Twitter feed as well or my Twitter feed which is @jonathandenwood. And also try and join our Facebook group. There’s links on the website. I’m going to really try and do some effort on that and get that up and going. Maybe even JJ will join our group and contribute some Wizard remarks. That would be really quite nice. So we’ll see you this Friday. We’re going to have the last show of 2017. Me and Kim are taking a little bit of a festive break after that. But we’ve got some great interviews in 2018 all lined up. Almost fell there but I retrieved it, didn’t I Kim? So thank you for listening and if you don’t listen to the Friday show, which you should, it’s going to be great, we’ll see you in the New Year. And the last thing. If you’re really generous in this festive season, go to iTunes and give us a review. It really helps the show. And it’s amusing, the good Wizard remark, I will speak it out on the show as well. So we’ll see you hopefully on Friday. Bye. Male Voice Announcer: Thanks for listening to WP-Tonic. The Podcast that gives you a spoon full of WordPress medicine twice a week.